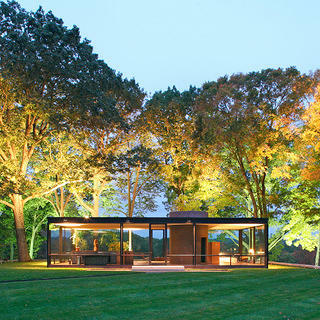 Architect Philip Johnson’s nearly invisible, nearly all-glass Glass House is perched on a hillside in New Canaan, Connecticut. Built in 1949, the house has all the usual conventions of a home—a kitchen, living room, dining room, bedroom, and bathroom. But there’s plenty of the unconventional, too. For instance, there are no walls inside. And, of course, there’s the fact that it’s almost entirely glass. But there’s more to the Glass House than just the Glass House. And while it is perhaps the main attraction for anyone visiting this National Trust Historic Site, there are 13 other structures throughout the site’s 49 acres. You read all about the recently restored Sculpture Gallery in the Winter 2017 issue of Preservation magazine; here, we take you on a tour of a few more cool spots. If the Glass House is a study in light and transparency, the Brick House, also built in 1949, is its opposite. 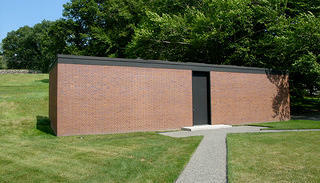 Located 80 feet from the Glass House, the Brick House is solid, private, and enclosed. Made almost entirely of brick, as its name suggests, its only windows, other than its skylights, are at its rear. Inside, there are guest bedrooms and bathroom, and unlike the Glass House, there are walls separating the rooms. Johnson remodeled the Brick House’s interior in 1953, adding a narrow corridor with a skylight to connect a bedroom and reading room. The Brick House is currently closed to the public, as it is undergoing restoration. 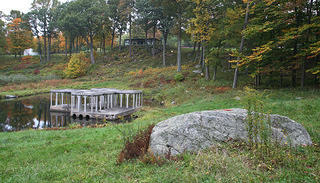 Perched atop a man-made pond at the bottom of a hill below the Glass House lies the Pavilion in the Pond. 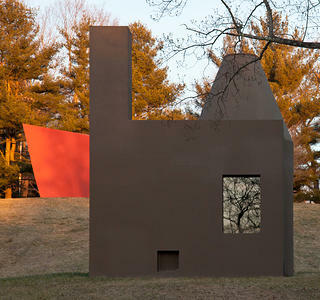 The Painting Gallery, built in 1965, was designed to house the impressive collection of large-scale paintings that Johnson and his partner, David Whitney, acquired throughout their lives. 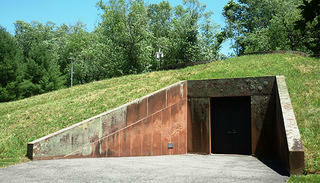 Its exterior is a grass-covered mound, and it’s accessed through a monumental red sandstone entrance. 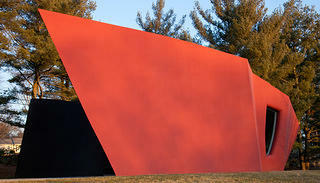 Once inside, there’s a series of movable walls that hold the paintings, including works by Andy Warhol, Robert Rauschenberg, Cindy Sherman, and Frank Stella. The one-room studio was built in 1980. From the outside, the small structure is hardly conventional, with its cone-shaped dome atop of stucco box. But inside, it’s a cozy workspace and library, with a small window, skylights, a fireplace, and bookshelves filled with 1,400 volumes on architecture. The house is a bit of a trek from the Glass House. To get there, you cross through a field of grass and wetlands. It’s isolated. This was on purpose. Johnson needed a quiet place to work, free from distractions—there’s no telephone or running water and only one small window—and far enough from his house that he wouldn’t be tempted to stop working and tend to other things, or stare out its glass walls at the landscape beyond. Both a building and a sculpture, Da Monsta was built in 1995 as a gate house. It was the last structure Johnson built on the property. He said it was inspired by a museum in Dresden that had never been built, designed by artist and friend Frank Stella. Inspiration also came from German Expressionist Hermann Finsterlin. Today the building is largely empty, used to store temporary exhibitions.